That was a close race. The race to $1 trillion has been heating up all year, with Amazon.com's (NASDAQ:AMZN) strong gains in 2018 allowing it to rapidly close the gap with Apple (NASDAQ:AAPL). However, the Mac maker officially crossed the finish line on Aug. 2, just days after reporting better-than-expected earnings results for the fiscal third quarter that saw Apple continuing its aggressive share repurchase activity. But Amazon isn't far behind: Amazon has now achieved the $1 trillion threshold about a month later. Jeff Bezos. Image source: Amazon. Amazon had approximately 487.7 million shares as of its latest Form 10-Q, which puts the per-share price threshold to $1 trillion in market cap at $2,050.27. Shares hit a high of $2,050.50 this morning before retreating back below the magic number. The e-commerce giant's continued expansion into other markets, combined with its ongoing diversification of existing businesses, has bolstered investor confidence. The company pushed big into physical retail with last year's acquisition of Whole Foods and even wants to shake up healthcare, as evidenced by its health venture with JPMorgan and Berkshire Hathaway and its recent acquisition of online pharmacy PillPack. Meanwhile, Amazon is growing its advertising business across numerous properties, its highly profitable Amazon Web Services (AWS) cloud infrastructure segment continues to dominate, and the company remains a top player in the booming smart speaker market (no pun intended). In addition to being the richest man in modern history, CEO Jeff Bezos is also apparently a style icon now. 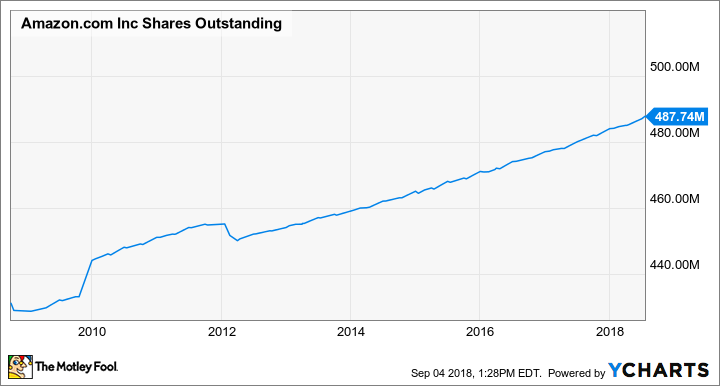 Keep in mind that since the $1 trillion per-share threshold is based on the most recent count for shares outstanding, it's a bit arbitrary, as the number of shares outstanding changes throughout the quarter. More specifically, Amazon's shares outstanding continue to march ever higher as the company issues new shares for things like stock-based compensation. That also means that Amazon's market cap slowly swells over time, too. It's quite possible that after factoring in for growing shares outstanding, Amazon is already well into $1 trillion territory and investors just don't know it yet. AMZN Shares Outstanding data by YCharts. That's in direct contrast to what Apple has been doing in recent years: Buying back a copious number of shares in order to reduce shares outstanding and deliver earnings accretion to long-term investors. It's now been about six and a half years since Amazon bought back any stock, with the last repurchase being back in Q1 2012. 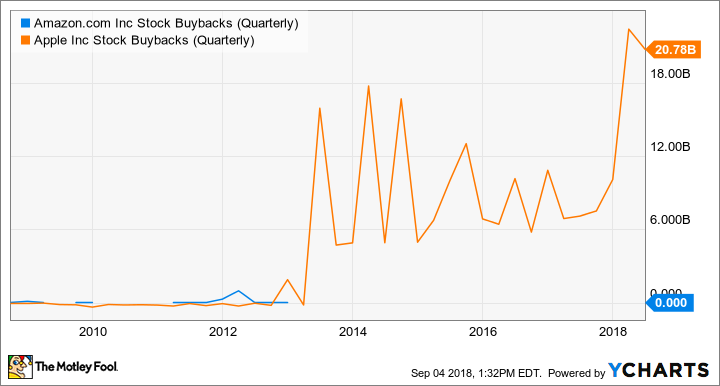 AMZN Stock Buybacks (Quarterly) data by YCharts. Technically, Amazon does have a repurchase authorization of $5 billion, a program that its board authorized in February 2016. Management simply chooses not to utilize it. But with shares trading at over 160 times earnings, who can blame them?